1963: Assigned a "How I Spent My Summer Vacation" essay, Susanna, a seventh-grade transfer student, is mystified, because at her old school she never had to write an essay. 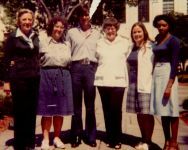 1968: Awarded the junior class prize for excellence in writing. 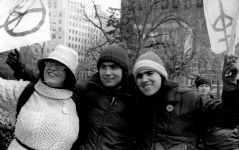 1969–1972: As a Georgetown University undergraduate majoring in Arabic and unofficially minoring in political activism, contributes book and other reviews to the college newspaper, the Hoya. 1972–1974: After transferring to the University of Pennsylvania, writes weekly column for first the Daily Pennsylvanian's 34th Street magazine, then for the Penn Voice. 1975: Keeps daily journal during three-month hitchhike around Great Britain and Ireland. 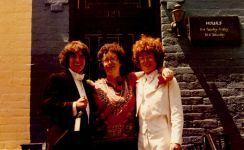 1978: Review of Mary Daly's Gyn/Ecology: The Meta-ethics of Radical Feminism is published in off our backs, after which she begins to consider herself a writer and to focus on writing for an audience. 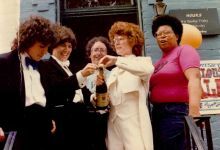 1978–mid 1990s: Many reviews, essays, interviews, and poems published in many feminist and gay publications, including off our backs, Lesbian Contradiction, Lesbian Ethics, Sinister Wisdom, Trivia, Lambda Book Report, and Calyx. 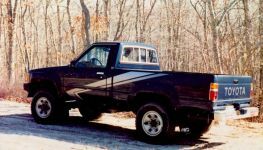 1981–1985: As book buyer for Lammas Bookstore, Washington, D.C., edits (and writes most of) the Lammas Little Review, a quarterly book review newsletter. 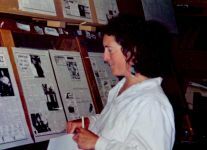 1984–1996: Writes the fantasy/science fiction column for the bimonthly trade journal Feminist Bookstore News. 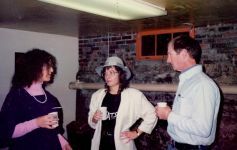 1985–1987: Assistant director, Feminist Women's Writing Workshops, Ithaca, N.Y.
1985–1994: As a volunteer at Wintertide Coffeehouse, organizes regular readings by local poets and writers; a highlight is the SRO Banned Books reading in January 1994. 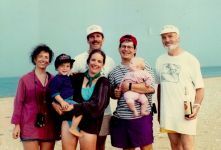 1988–1993: Contributes regular theater reviews and other features to the Martha's Vineyard Times. 1989: Self-publishes Leaving the Island, a poetry chapbook. 1989–1991: Edits three original anthologies of fantasy/science fiction by women, all published by Crossing Press: Memories and Visions (1989), The Women Who Walk Through Fire (1990), and Tales of Magic Realism by Women (1991). 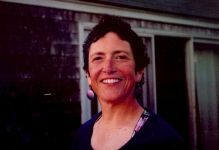 1991–1993: Features editor, Martha's Vineyard Times. 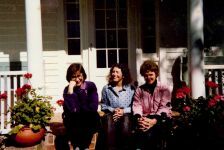 1993: First one-act play, Persephone's Mother, is a winner at the Nantucket Short Play Competition; it is produced in 1994 as part of the Spring Short Play Festival at the Vineyard Playhouse. 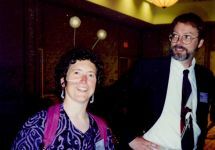 1994: Chaired jury for James Tiptree Jr. Memorial Award; presented award at Potlatch 4, Oakland, Calif., February 1995. 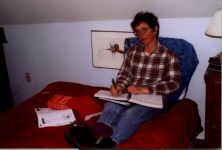 1994–1998: Several short stories published in various anthologies, notably "Deer Out of Season" (in Lavender Mansions: 40 Contemporary Lesbian and Gay Short Stories, ed. Irene Zahava, Westview Press), which became the backstory for her first novel, The Mud of the Place. 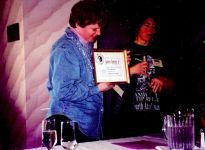 1997: Honored as special guest at WisCon 21, Madison, Wis., for her contributions to women's fantasy/science fiction. 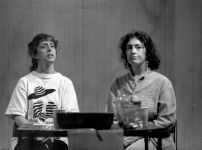 1997: Persephone's Mother and Prayers for the Dead, one-act plays, produced as part of Threshold Theatre's short play festival, Boston. 1998: A Midsummer Night's Alternative, a one-act play, staged at WisCon 22. 1998–2002: Writes her first novel, The Mud of the Place. 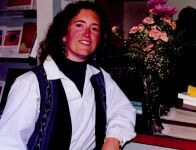 2003: Serves as juror for Gaylactic Spectrum Award, novel division. 2003: Resumes reviewing: two reviews published in the Women's Review of Books. 2004: Retina of right eye detaches not once but twice, requiring two surgeries and increased workload to pay for same; the silk purse created from this experience is the essay "My Terrorist Eye: Risk, the Unexpected, and the War on Terror." 2005: Launches website and begins blogging. 2006: Review of Julie Phillips's James Tiptree, Jr.: The Double Life of Alice B. Sheldon featured on cover of Women's Review of Books. 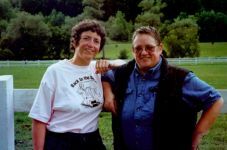 2007: "Showing at Makonikey," an excerpt from The Mud of the Place, featured at the Boston Fiction Festival and in B-Far, the Boston Fiction Annual Review. 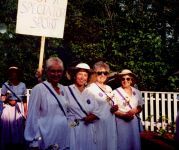 2008, May: "A Midsummer Night's Alternative" staged at the Vineyard Playhouse, Vineyard Haven, Mass. 2008, December: The Mud of the Place published by Speed-of-C Productions. 2009: Essay "And Will Rise" accepted for publication in Trivia: Voices of Feminism, issue 10. Review of Farah Mendlesohn's anthology On Joanna Russ accepted for publication in the January-February 2010 Women's Review of Books. Op-eds published in the Vineyard Gazette and the Cape Cod Times (online). Begins work on To Be Rather Than to Seem: A Writer's Education, a personal/political memoir. 2010: Invited to be a contributing columnist to the Women's Review of Books blog.